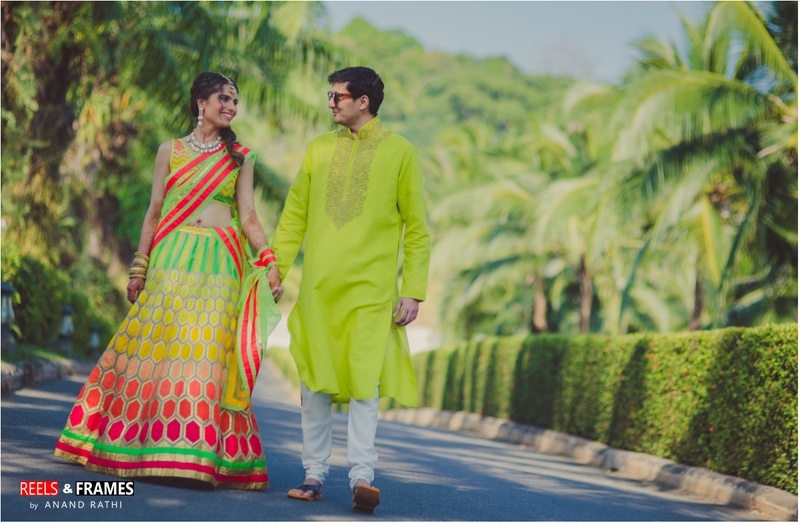 Neon-Themed Indian Wedding Held at Sofitel Spa and Golf Resort, Thailand. The couple wanted the international destination wedding at a sub-tropical location. So it was held at Sofitel, Krabi. – A beach side Spa and Golf Resort, Thailand. The two love birds met in London while studying. The wedding events included a traditional Thai guest welcome, Mehendi, Sangeet, Haldi and Wedding. Our gorgeous bride hails from a Marwari background while Prabhas is Punjabi, so it was a multi-cultural wedding comprising of various wedding rituals from both sides. Mehndi décor was themed around Punjabi culture. It included a giant truck shaped photo booth and Punjabi folk singers. For the Thai night, a 30 feet high tower of the champagne glasses was the highlight of the décor. Local Thai dancers, fire breathers and kick boxers entertained the guests. The Sangeet décor was aqua themed. The wedding was a more traditional affair with a floating wedding mandap setup inside the pool! Read on for a detailed idea. The wedding shoot that place amidst the serene waters and beautiful sunsets of Krabi, Thailand. The couple chose a casual colour palette of aqua that offered a laid-back, romantic vibe to the shots that were captured by Reels & Frames by Anand Rathi. For the first set of shots, Pallavi wore an informal dress with floral prints, while Prabhas co-ordinated with his lady by wearing a navy, Hawaiian shirt with loud, fun florals. For the second scene, they changed into something more formal, though they maintained their blue colour palette. Sofitel Spa and Resort was where the wedding celebrations were to be held. The resort had some brilliant entertainment set for the wedding party’s welcome. Local Thai dancers, fire-breathers and kick-boxers were the main events that made the night unforgettable. The Mehndi ceremony was all things colourful. The couple wanted to incorporate a unique and fun theme, and so they did. The neon-themed ambience set off the perfect mood for the fun-filled event. Vibrant drapes, floral décor and a creative photo-booth added to the aesthetics of the location while tropical dancers and water guns amped its entertainment factor. Look out for Pallavi’s one-of-a-kind neon lehenga by Abu Jani and Sandeep Khosla that stole our hearts with its exclusiveness! The couple made their entry in a decorative Thai boat. Our lovely bride donned herself in a magical masterpiece by Anamika Khanna and her groom looked dashing in a well-tailored 3-piece suit. Floral decoration, colourful suspended lanterns and glass orbs with candles added to the beauty of the event. The wedding day at Sofitel Spa and Resort, Krabi started off with a fun-filled haldi ceremony with our couple getting drenched in the yellow milk mixture and absolutely having a ball with it. The wedding that followed had our bride looking beyond gorgeous in a red Abu Jani and Sandeep Khosla ensemble with intricate floral work. She paired it up with sparkling diamond jewellery and equally glittery footwear. The groom graced his big day in a smart light gold sherwani by Sabyasachi with matching juttis and a safa. The traditional ceremonies went on and the couple couldn’t seem happier. The day concluded with beautiful fireworks to commemorate this couple tying the knot.